For many years, the standard front-line therapy for advanced renal cell carcinoma (RCC) with clear cell histology was single-agent treatment with a vascular endothelial growth factor (VEGF) targeting tyrosine kinase inhibitor (TKI). Recently, however; immunotherapy with the PD-1 inhibitor nivolumab in combination with the CTLA-4 inhibitor ipilimumab was approved for use in patients with intermediate- or poor-risk advanced RCC. Several ongoing trials are evaluating other checkpoint inhibitors in this setting. 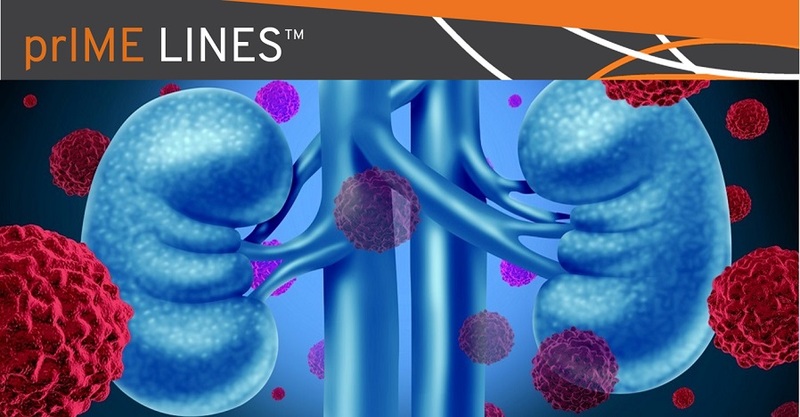 In a phase Ib study, combination of the PD-L1 inhibitor avelumab with the VEGF TKI axitinib resulted in a high objective response rate (ORR) and favorable safety profile, and this combination was further evaluated in the phase III randomized JAVELIN Renal 101 trial (N = 886). At the 2018 European Society of Medical Oncology (ESMO) Congress, Robert Motzer, MD (Memorial Sloan Kettering Cancer Center, New York, United States), presented first results from this trial comparing the combination of avelumab and axitinib to sunitinib monotherapy in treatment-naïve patients with advanced RCC. The study met its primary endpoint of significant improvement in median progression-free survival (PFS) per independent review committee (IRC) in PD-L1-positive patients. In these patients, the combination of avelumab and axitinib resulted in a median PFS of 13.8 months, compared to 7.2 months with sunitinib (HR 0.61, P<.0001). The combination of avelumab and axitinib also resulted in a significant improvement in median PFS in the total patient population, which included PD-L1-low and PD-L1-negative patients (13.8 months vs 8.4 months; HR 0.69, P = .0001). The PFS benefit favored avelumab plus axitinib in all prespecified patient subgroups, including all-risk groups. The ORR per IRC among PD-L1-positive patients treated with avelumab plus axitinib was 55%, compared to 26% with sunitinib. In the overall population, avelumab plus axitinib resulted in an ORR of 51%. At data cut-off, 73% of PD-L1-positive patients who responded to avelumab plus axitinib had ongoing responses. Overall survival (OS) data are not yet mature and median OS has not been reached in either treatment arm (HR 0.78; P = .0679). The adverse event (AE) profile of avelumab plus axitinib was manageable and no new safety signals were observed. Immune-related all-grade AEs occurred in 38% of patients receiving avelumab plus axitinib, with hypothyroidism as the most common event, occurring in 21% of patients. Dr Motzer concluded that treatment with avelumab and axitinib combination results in a clinically meaningful improvement in PFS compared to sunitinib, with a favorable safety profile, and that these results support avelumab plus axetinib as a new, first-line option for patients with advanced RCC. In his discussion of this study, Viktor Grünwald, MD (West-German Cancer Center, Essen, Germany), commented that ‘’without survival benefit and quality of life improvement, it is uncertain if the combination is ready for prime time.’’ However, he highlighted the potential niche in favorable risk patients, where axitinib plus avelumab could be a new standard. Further follow-up of this trial is anticipated, as are several additional trials evaluating combinations of immunotherapy and TKI in the first-line setting. Ann Oncol. 2018;29(Suppl 8): Abstract LBA6_PR.